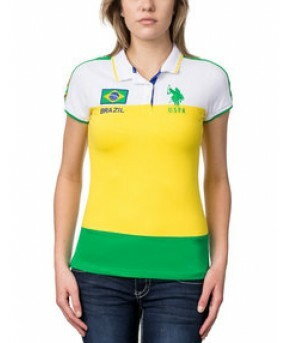 This season's sportiest polo shirt is emblazoned with Brazil and number two in bright yellows, greens and blacks. It's a great top for any time the mood strikes, day or night. Contrast tipped collar with contrast two-button front placket. Large stitched logo on upper left front, logo patch and appliquéd "Brazil" on front. Striped short sleeves with appliquéd number two. Appliquéd "Brazil" and number two on back.